One of the coolest things about PHP has to be the wide range of extensions available for the language. Having problems communicating with a particular database? PHP has a wide range of extensions for different databases. Want to process credit cards transactions? PHP includes an extension that allows you to integrate CyberMUT on your Web site. Want to parse and transform XML documents? PHP comes with a built-in SAX parser and XSLT engine. The moral of the story? You can do a lot of very interesting things with PHP. And one of the more interesting ones includes hooking PHP up to Java and accessing Java classes in a PHP script. Which, coincidentally, happens to be just what this article is about. PHP doesn't come with Java support turned on by default, so you'll need to recompile it to enable this support. You can do this by adding the "--with-java" compile-time parameter to the PHP "configure" script. Note that you'll also need a copy of the latest JDK - you can get this from http://java.sun.com/ (the examples in this article use version 1.3.0 of the JDK). If you're using Windows, you've already got a pre-built Java extension with your PHP distribution - all you need to do is enable it. First, make sure that your system's PATH variable includes the path to the JDK - this can easily be accomplished by altering the PATH variable in your "autoexec.bat" file. While you're editing this file, also drop by the "Windows Extensions" section of "php.ini" and uncomment the "php_java.dll" extension. Finally, check to make sure that the file "php_java.dll" is in the <php-install-dir>/extensions/ sub-directory, restart your Web server, and you're ready to roll! Let's begin with a simple example to verify that everything is working as advertised. This script uses built-in Java methods to check for the existence of a particular file on your system and display its size. This is fairly simple, and should be clearly understandable to anyone who knows basic Java programming. The first line of the script instantiates an object of Java's File class, and stores it in the PHP variable $fp. In case you're wondering, it's possible to pass parameters to the class constructor by specifying them as arguments when creating the object. In the example above, the second argument to the class constructor contains the location of the file to be displayed. Once the object has been instantiated, it becomes possible to access the methods and properties of the Java class using regular OOP syntax. In this case, the exists(), getAbsolutePath() and length() methods are all methods of the File class; however, I've managed to use them in a PHP script by virtue of the Java connectivity built into PHP. Now, the example on the previous page used a built-in Java class to demonstrate PHP/Java connectivity. It's also possible to instantiate and use a custom Java class in a PHP script. I'll demonstrate this by encapsulating the functionality of the core File class in my own FileReader class. There's no rocket science here - this class is only a wrapper for core File class methods. However, it will serve to demonstrate the basics of using a custom Java class in a PHP script. Now, compile the class, copy the compiled code to your Java CLASSPATH, and write a script to use it. This is similar to the first example, except that, this time, I've used my own custom Java class in the script. Once an instance of the class has been instantiated, class methods can be accessed in the normal manner. Next up, passing one Java object to another. This class uses a Writer object for script communication; this Writer object is instantiated via the setWriter() class method. Next, the class method reverse() accepts a string, reverses it and returns it via the Writer object. Compile this class, copy it to your Java CLASSPATH, and write a simple PHP script to access it. In this case, I've instantiated two objects, one for the ReverseString class and the other for the StringWriter class. Next, I've passed the StringWriter object, as stored in the PHP object $writer, to the ReverseString class via the class' setWriter() method, and then used the reverse() method to reverse a string and return the result. Next, let's look at exception handling. If you go back to the example on the previous page, you'll see that the Java class includes a couple of exception handlers, one for IOExceptions and one for everything else. Let's now modify the PHP script so that it includes some basic exception handling. This version of the script uses two built-in PHP functions to check whether or not any exceptions were raised during the execution of the class methods. If any exceptions were raised, they would be stored in the $e PHP variable, and printed via a call to the toString() method. Of course, this simple and graceful error message gets a little more unfriendly if you remove the @ error-suppression operator. This script consists of two parts: the form which allows the user to select a temperature scale and enter a tempterature value, and the form processor which actually uses the Bean to perform the conversion and display the result. 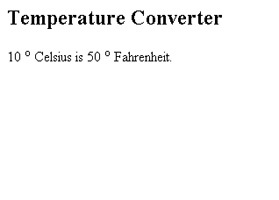 Once this form has been submitted, an object is instantiated from the Temperature class, and the information provided by the user is used to perform temperature conversion using the Bean methods described above. The result is then displayed to the user. Note that it's necessary to convert the type of the form variable $temp from string to integer in order to make it compatible with the arguments expected by the Bean - this data type conversion is one of the important issues you will face when accessing Java classes through PHP. Note: All examples in this article have been tested on Linux/i586 with JDK 1.3.0, Apache 1.3.20 and PHP 4.1.1. Examples are illustrative only, and are not meant for a production environment. Melonfire provides no warranties or support for the source code described in this article. YMMV! This article was first published on 22 Mar 2002.